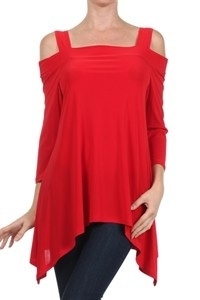 Slinky 3/4 sleeve top that can be matched with coordinating skirts and pants. 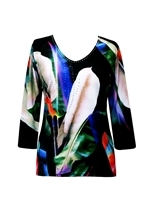 This is a 2 point top that is ideal worn with leggings but looks great with palazzos or jeans. Hand or machine wash in cold water and let it dry naturally. Never wrinkles - great for traveling. 100% polyester.